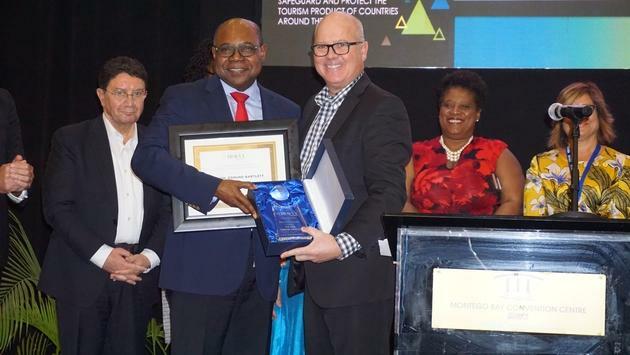 Edmund Bartlett, Jamaica tourism minister, receives travAllianceMedia’s Chairman’s Global Tourism Innovation Award from John Kirk, editor in chief of TravelPulse Canada, at the ceremony launching the Global Tourism Resilience and Crisis Management Centre. (Photo by Brian Major). Tourism-reliant Caribbean destinations not only face deadly storms, but also threats from phenomena ranging from climate change to potential pandemic outbreaks. These concerns have led several international tourism groups to launch a new Global Tourism Resilience and Crisis Management Center (GTRCM), described as the first organization to formally address these persistent dangers. GTRCM is a tourism resource center dedicated to conducting “policy-relevant research and analysis on destination preparedness, management and recovery” due to disruptions and crises that impact tourism. The organization, based at Kingston, Jamaica’s Mona campus of the University of the West Indies, was announced by Edmund Bartlett, Jamaica’s tourism minister, at the Caribbean Hotel & Tourism Association’s Caribbean Travel Marketplace conference in Montego Bay on January 30. GTRCM’s establishment creates “a means by which information, communication and knowledge can be disseminated and dispersed in real time,” Bartlett said. “The (GTRCM) will focus heavily on the critical elements that will make Jamaica and the Caribbean among the safest destinations in the world,” he added. 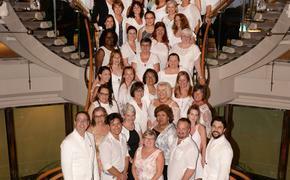 GTRCM is supported through a partnership that includes the World Travel & Tourism Council (WTTC), the Pacific Asia Travel Association, Travel Corporation, the Jamaica National Group, Mediterranean Tourism from Malta, Pacific Tourism Authority in Bangkok, the Tourism International Conference of Mauritius, the Crisis Management and Resilience Council in London and Global Rescue, said Bartlett. GTRCM will initially focus on four specific areas: Climate change and disaster management; security and cybersecurity; entrepreneurial management and data analytics; and pandemic and epidemic management. The organization is co-chaired by Dr. Taleb Rifai, former Secretary-General of the United Nations World Tourism Organization (UNWTO). Rifai’s responsibilities include oversight of a coalition of academic partners including: Queensland University in Australia; The Hong Kong Polytechnic University; Bournemouth University in the United Kingdom; Northeastern University and George Washington University in the United States; the University of the West Indies; and the International University of Japan. 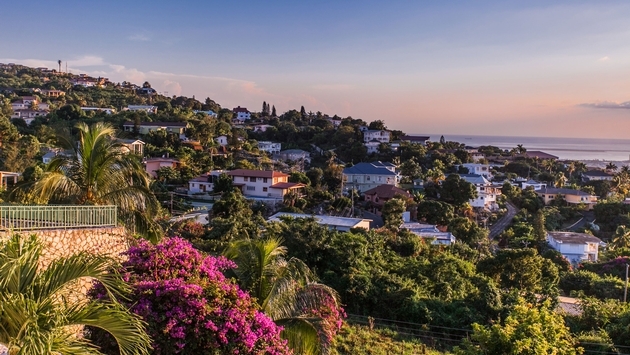 GTRCM’s launch will “ensure that the [Caribbean will] continue to benefit from the economic, social, cultural and historic value of tourism, which is its primary income earner,” said Dominic Fedee, chairman of the Caribbean Tourism Organization (CTO) and Saint Lucia’s tourism minister. “A lot has been said about the environmental challenges that hurricanes present but they are perhaps the single-largest threats to our economies,” Fedee said. He also mentioned a World Bank study, which found disasters impact gross domestic product in developing states at a rate 20 times higher than in industrialized nations. “Of all the major industries globally, none face greater exposure to disruptions as the tourism industry, but it also has proven again and again that it has the greatest capacity for recovery,” said Andrew Holness, Jamaica’s prime minister. “I am very pleased that Jamaica is leading this initiative and that, in the spirit of true collaboration and partnership, tourism in all nations will benefit from the strategic solutions emerging from the [GTRCM],” he added.